Size: * 9' 8wt. 9' 5wt LP 9' 5wt 10' 7wt. 10' 8wt. 8'10" 10wt. 9' 4wt LP 8'10" 9wt. 9' 10wt. After many years of research, hard work and continual technological improvements, Loomis's new and most dynamic achievement incorporates all the basic elements that make great fly rods… high modulus graphite, great tapers, the finest in componentry and a new, hi-tech, proprietary resin system. This along with Steve Rajeff’s design ability helped us create an insanely lightweight, ultra-high performance series of salmon & steelhead fly rods… we call them NRX! They are fast action, powerful fly rods designed to fish floating, sinking or shooting lines with plenty of power to handle big fish and big water. When conditions call for long, delicate casts using extremely light leaders to help you fool spooky fish, the NRX LP rods are the answer. 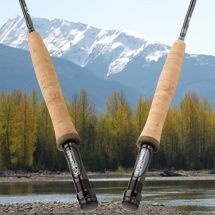 They are smooth casting, soft tapers for managing long, whisper-thin leaders and small to medium-sized dry flies. They track true for exceptional accuracy and control, plus they are light as a feather with beautiful lines, featuring select species cork and your choice of Loomis original, stealthy look in matte black with bright blue wraps or a more traditional Evergreen with subtle green wraps and silver trim. When the fish get finicky and the water gets low and clear you will have the answer... NRX LP!